Weekend at Grandma & Grandpa’s! The Friday after Thanksgiving Namine got to have dinner with us and spend the night. That was the start of a whole weekend here at grandma & grandpa’s! The added bonus was Auntie Lydia was home from grad school those days so Namine got lots of play time & Aunt Lydia cuddles. 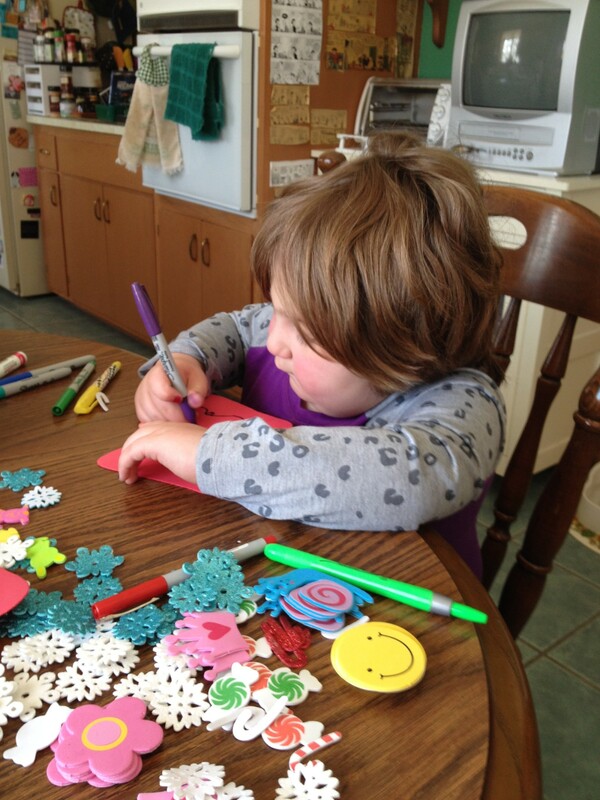 On Saturday morning we made Christmas decorations. All those fun stickers and markers and cool little angels that you scrape off the black color to reveal a rainbow of colors underneath. We all had fun making wreaths, and trees, and angels. After all that hard work the girls were hankering for some chicken so we went to KFC. We did a little shopping and surprisingly it was not too crowded. Then we went to see the movie Big Hero 6. It was terrific. The little short before the main movie was called Feast and it was about a little dog. I’ve never heard Namine laugh as hard and as long as she did watching that tiny short. The movie was a big hit and kept her laughing! Home to ham & bean soup, which she loved, bath time (complete with all the Little Mermaid toys we have). 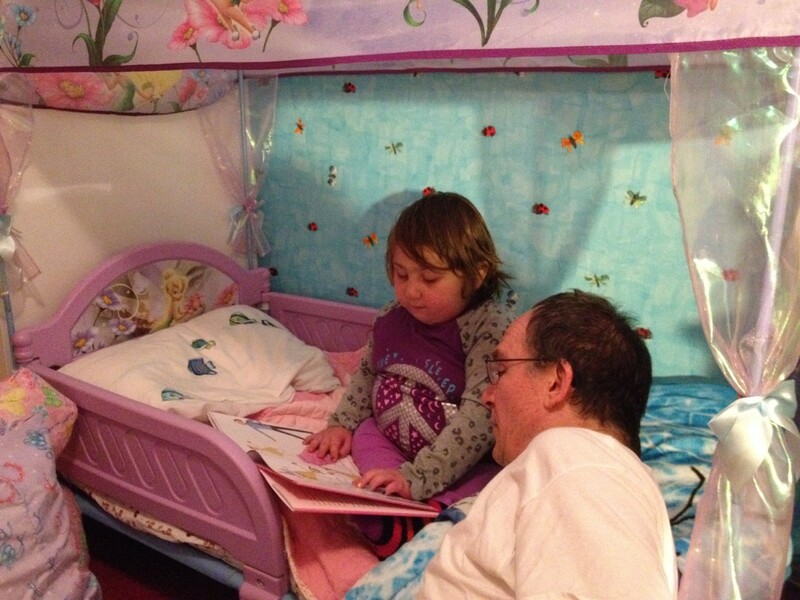 When asked what story she wanted us to read to her she quickly picked out Pinkalicious and said she was reading US a bedtime story. She amazed us with her reading ability. I knew she was good but, WOW, that was a hard book with made-up words that she read like a pro! Sunday we had to get up really early to drive Lydia to the Chicago train station. Namine & Lydia slept most of the way there, which I was glad. After Lydia got on her train, the three of us went looking around (we always wait until Lydia texts us that the train has left the station). Union Station was decorated with some really big Christmas trees with train ornaments. Namine liked them. Once Lydia let us know her train had left we walked to Dunkin’ Donuts for a treat! Then we went to Gurnee Mills. We went to the Disney store (of course!) and got there just before opening. One of the workers came out and asked a few of the kids if they wanted to help open the store. Namine was a bit shy but then when the worker asked who wanted to wear Mickey’s wizard hat & cape (from The Sorcerer’s Apprentice) She quickly raised her hand! 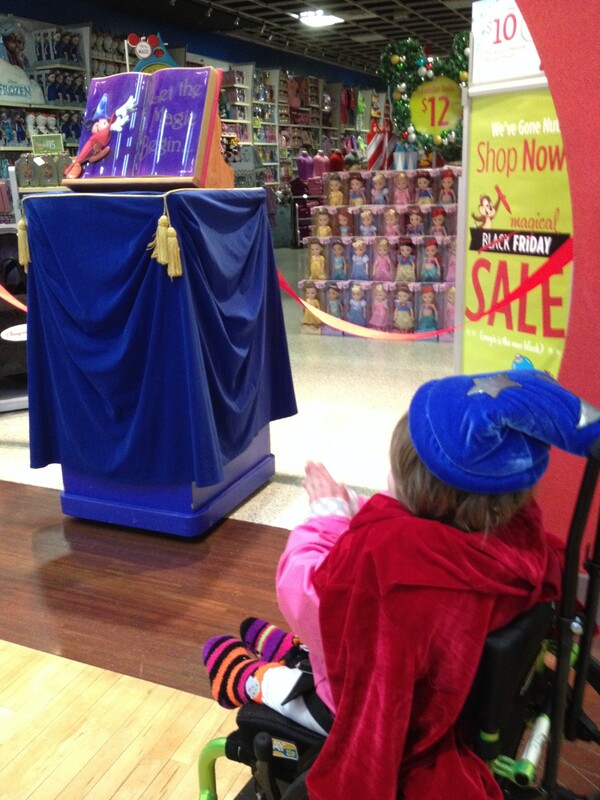 She got to say the magic words, “Let the magic begin” and all the lights turned on in the store! We browsed awhile and went looking in other shops (it’s a big mall!) Then decided to have lunch at The Rainforest Cafe. Namine wanted the monkeys to jump out of the trees and eat with her! After a yummy lunch we went to the Jelly Belly Factory, where, since Namine can’t have gummy, sticky candy, she scored with samples of chocolates! Off to home we went with bellies full to meet Paul & Jess. It was a very full weekend and lots of fun.